I am too young… and I need help with valuation! Usually, I’m very good about planning ahead, but for some reason, I’m a little bit confused about what I should with this booking. I am going to BACON as some of you may know, and originally I planned to stop in NYC after the weekend in Colorado Springs for just under two weeks and then take CX F JFK-YVR on the way back. Now I am itching to go to Toronto to visit my relatives, which isn’t that much of an issue, but my departure dates for Toronto are now around two weeks out and I’m having trouble finding space that works with my times, partly because my parents aren’t comfortable with me taking a taxi/public transportation/etc. to LGA or JFK myself (Ok now probably you all know how old I am now. :P). So my aunt would drive me to JFK but the only dates that would work are in business for the outbound and inbound segment (the flights to LGA that have space don’t work with her work schedule). That means it’s 18,000 avios, which theoretically isn’t too bad given that I transferred with the 50% bonus from AMEX, compared with a price which is hovering around ~350 on Westjet. Then there’s also the fact that you can use avios + money on AA redemptions, so I’m given the option to buy 9,000 avios for 130, which is 1.44cpm. I could potentially take that given that I don’t have access to 100,000,000,000 sign-up bonuses for the Chase Visa. So now I have several different options and I’m trying to wrap my head around the valuations. What should I do/What do you think I should do? 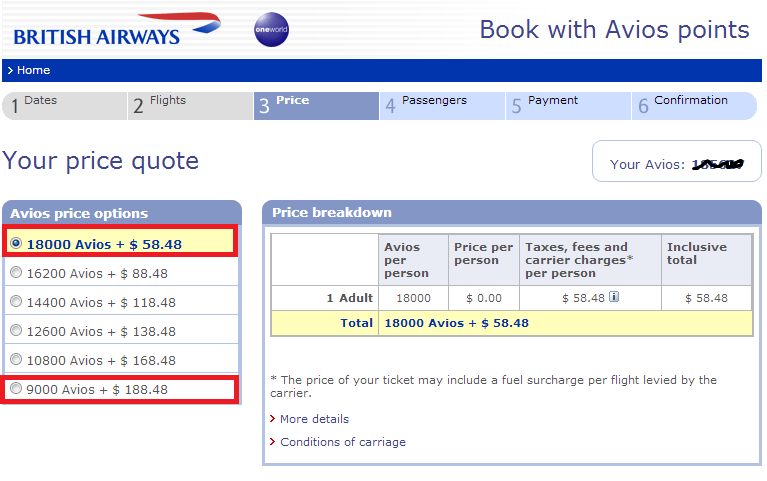 It’s either $350 (plus BIS miles), 18,000 Avios + $60, or 9,000 Avios + $190. I think this scenario definitely kicks the miles valuation attempts wide open because there’s a difference between actual value which is cost of ticket versus miles (so that means up to 25cpm on international F) and the perceived value. If you simplify the options to just pure cash and pure miles (assuming BIS miles are negligible), that means you can either $350 or 18,000 avios and $58.48 = ~$60 (to simplify calculations). So that means 18,000 avios nets around 1.6 cents in value. But if you add in the fact that you can buy 9,000 avios (in this redemption) for $130, that means the other 9,000 avios that leave your account are now worth $350 = $60 + $130 + 9,000 avios, which means each avios in this redemption is worth an actual value of 1.77 cents. But then does that make the value of avios only 1.44 cents given that you can buy points (in itineraries like this) for that price? Obviously a more clear example is that if the exact same flights both award and paid are available with money for $5000 or 100,000 points, that doesn’t make your points really worth 5 cents. The actual redemption value is 5 cents, but then the maximum value of the miles is the price you purchase them at, which is for example 2.5 cents. I guess it’s definitely harder in this case to place a value on this miles and on this redemption, since you can only buy miles at this price only in this certain itinerary and you don’t actually get to keep them (if you refund your ticket you get your money back). I mean obviously miles are meant to enjoy experiences whether it’s worth it or not… or is it? What would you suggest? Please comment! My head is still spinning after reading this – but I’m looking forward to meeting you at BAcon… and if you do end up in NYC afterward as well, let me know if you want to meet up, or need any restaurant recos! Sure, I would love that! Sorry I can’t go. Enjoy the trip! Teenagers use the nyc subway and taxi all the time. Try to use an airport shuttle or private car service if it relieves your parents. 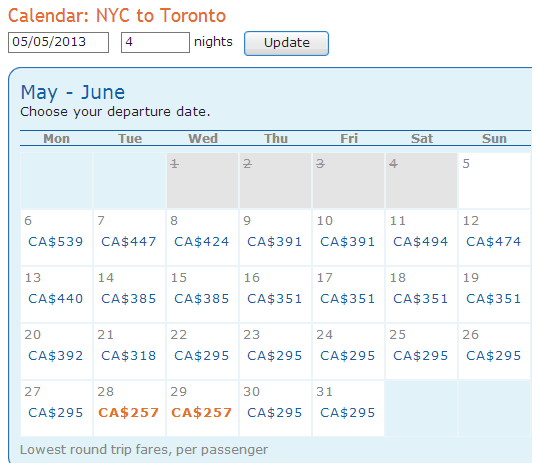 An alternative is to take the megabus or Chinatown buses from NYC to Toronto for $20 each way. But then you see I have to pay for car services which basically offsets the cost of saving 4,500 avios. I’d rather not take the bus for 10 hours – too long for me! Jeff, it depends on what you want to do – collect some BIS miles for status or go cheap? I’d use the Avios and the cheapest $ amount unless you can add segments to increase your BIS miles take for the straight cash option. Take the subway…you’ll survive. Unfortunately I don’t think WS gives you EQM… does it? Only RDM I think. Take a super shuttle. And taxi’s are safe in NY.